For better to backup your files and data based on the last time backup. Save storage space while backing up. Use incremental backup or differential backup to back up data. Incremental backup and differential backup are option of backup types, you can choose any one of them to backup files and data after first full backup. Incremental Backup: It will backup all changed or increased data and files based on the full backup created in the first time or the incremental backup created in last time. This means that, the target of incremental backup in the first time is all changed files based on the full backup; in the second time, its target is all changed files based on the last backup (not the first backup), and by this analogy. The prevalent advantage of incremental backup is that backup time is short, because there is no repeated date, and the quantity of data is small. Differential Backup: It will backup all changed data and files during the period from the first full backup to now. Comparing with incremental backup, it always backup changed files based on the first backup (not the last backup). This function’s advantage is that the space image file occupy will be small. Many people know how important the data and files are, but some of them always complain that storage space is not sufficient or backup will waste much time. 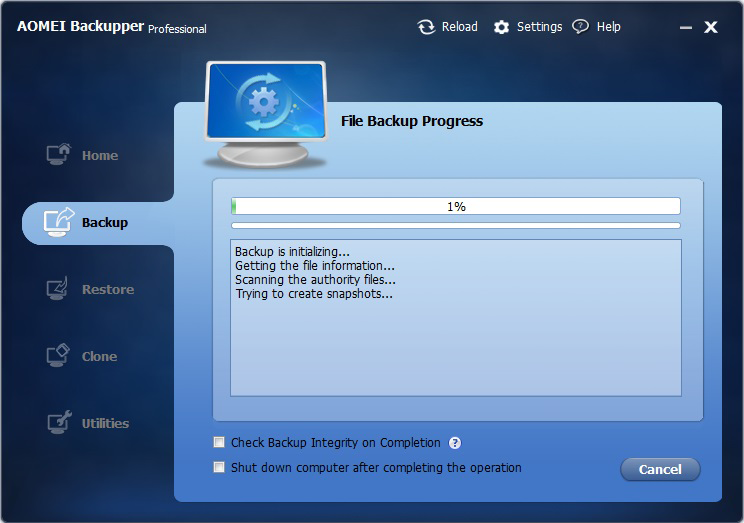 Under this circumstance, if you want to backup your increased data and files, Incremental Backup or Differential Backup in AOMEI Backupper will be a key to solve all problems bothering you. How to use incremental/differential backup to back up data? Step1. . Download, install and launch AOMEI Backupper. Select " Home " and choose a backup task. 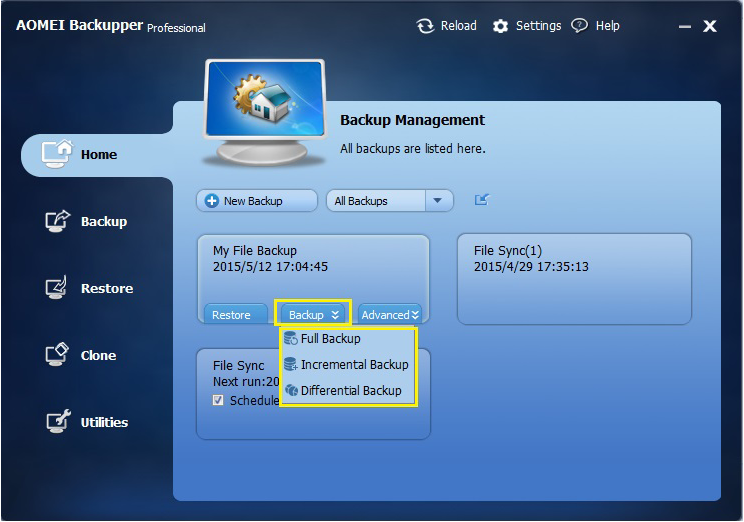 Click " Backup " option and there are many backup types, which contains Full backup, Incremental Backup and Differential Backup. You can choose any one of them to backup data. 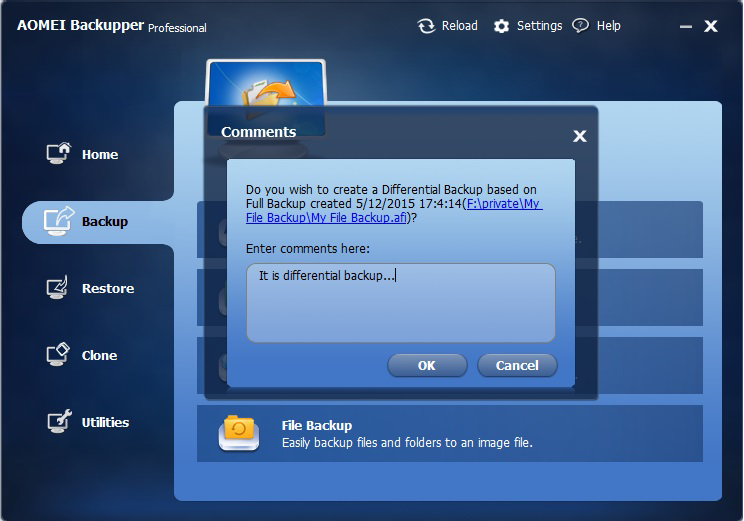 Step2. . A window will popped up and you can enter comment there to distinguish from other backup. After finishing, please click "OK". Step3. . Backup process will run automatically. If you want to know more about incremental or differential backup, please refer to following documents and video.